Keeping eggs in stasis during childhood is key to a woman's fertility. New research published January 1st in Nature Structural and Molecular Biology helps explain the role of epigenetics in maintaining egg cells in a state of equilibrium. A team led by Gavin Kelsey PhD, Epigenetics Program, Barbraham Institute; Centre for Trophoblast Research, University of Cambridge, Cambridge, United Kingdom (UK), along with colleagues in Dresden and Munich, Germany, studied the protein MLL2 and discovered it sustains a distinct pattern of epigenetic marks which maintain egg cell inactivity. A fertilised egg cell is the start of every human life. Yet, egg cells are created inside a woman's body before she is born, and kept in stasis throughout her childhood until they are needed in her adult life. If egg cells don't go into stasis they won't become mature eggs. Putting an egg cell into a state of inactivity involves adding many epigenetic marks throughout all of its DNA. These marks attach to the DNA strands, acting like footnotes to indicate which genes should turn 'on' or 'off' and at what times. Scientists want to understand where these marks come from and if mistakes in their placement can cause disease. It is a difficult challenge in such a small, non-regenerative population of cells. The team had to create a new highly sensitive way to detect epigenetic marks in human eggs. Using their new approach, they found that as an egg develops, H3K4me3 is spread throughout the entirety of its DNA, its genome. The H3K4me3 mark had already been identified in many active cells as the start button, so to speak, of a gene. However, H3K4me3 in egg cells acts differently. MLL2 protein appears to be responsible for this "quieting" affect on H3K4me3. Without MLL2, most H3K4me3 marks in eggs are lost and the egg cells die. H3K4me3 is a histone which denotes the molecular process that wraps proteins into a spiral to fit into the tight nucleus of a cell. Its name, H3K4me3, tell us the tri-methylation of lysine 4 is located on a subunit of the histone H3 protein. This structural modification affects the ability of that gene to be "active" or become "silent." "Our findings show that H3K4me3 is created in two ways. MLL2 can add an H3K4me3 mark without any nearby gene activity, while another process — not using MLL2 — will place the same H3K4me3 mark around active genes. "By studying this newly identified mechanism, we hope to expand our knowledge of epigenetics in general adding to our understanding of fertility." 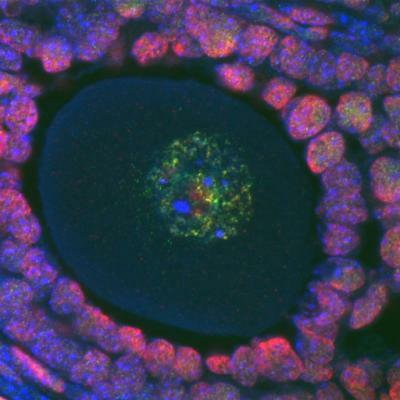 Lead scientist, Dr Kelsey, adds: "We are only beginning to unravel the details of the connection between epigenetics and egg development, a fundamental aspect of biology that may play a part in transmitting information from mother to fetus. Discoveries like this highlight some of the unusual biological processes that take place in these highly important cells." H3K27ac and H3K27me3 marks throughout oogenesis. In nongrowing oocytes, H3K4me3 was restricted to active promoters, but as oogenesis progressed, H3K4me3 accumulated in a transcription-independent manner and was targeted to intergenic regions, putative enhancers and silent H3K27me3-marked promoters. Ablation of the H3K4 methyltransferase gene Mll2 resulted in loss of transcription-independent H3K4 trimethylation but had limited effects on transcription-coupled H3K4 trimethylation or gene expression. Deletion of Dnmt3a and Dnmt3b showed that DNA methylation protects regions from acquiring H3K4me3. Our findings reveal two independent mechanisms of targeting H3K4me3 to genomic elements, with MLL2 recruited to unmethylated CpG-rich regions independently of transcription. Mouse egg cell. Visible within the nucleus: BLUE — DNA; GREEN — Epigenetic methylation marks; RED — Acetylation epigenetic marks. Image credit: Courtney Hanna, Babraham Institute.